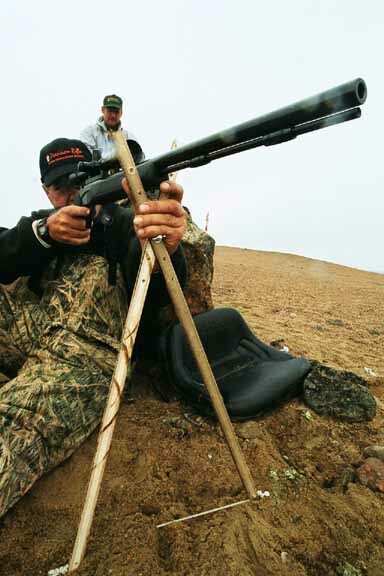 Some back ground: Our 2001 Caribou hunt was originally planned to test the .357 Dead Center bullets in .45 caliber rifles. At that time, CVA was the only company making .45s with the correct twist so we had to switch the .357 bullets to .40 and take our .50s. I booked the same hunt for 2002 for the purpose of returning armed with a bunch of .45 caliber muzzleloaders and a box of .357 bullets. In the year that passed, several new .45s hit the market with the correct twist and our testing began in earnest. My first job was to secure seven .45 caliber rifles with the twist of 1:28" to 1:30" for the trip. 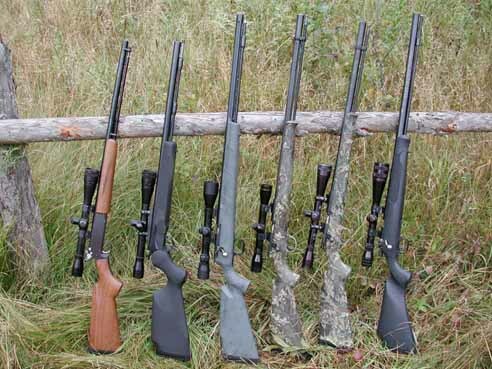 Our collection included three Kahnke rifles; a pair with 30" barrels and a light weight model with a 26" barrel, a pair of CVA; one with a 26" fluted barrel and one with a 24" barrel, a Winchester X 150, a Knight Super .45 ( 1:30" twist) and a prototype T/C Encore .45 barrel with a 1:28" twist. The test criteria: Along with the new guns came a brand new powder; Triple 7 by Hodgdon. After shooting several pounds of FFF and FF, it was adopted as the ONLY POWDER that would make the trip. The test criteria was simple. Each rifle had to shoot 2.5" or better groups at 200 yards or stay home. To keep everything simple, each gun was tested with 100 grains of FFF and FF powder using the 175 grain and 195 grain .357 Dead Center bullets. No gun was allowed the luxury of being fussy with powder charge as it would be enough of a nightmare to keep track of FF or FFF and 175 or 195 without throwing in a third variable. There was no surprise when the T/C Encore and Winchester qualified on the first try. There was also no surprise when the CVA 26" fluted barrel qualified on the first try as it had received some tweaking. We have shot enough Kahnke rifles that we fully expected them to all qualify and they did not disappoint. We were all a bit surprised when the 24" CVA, the least expensive gun of the bunch, qualified right out of the box with the very first load. The Knight did not qualify with any load tested. The Knight stayed home and the other seven continued to the next level of testing. 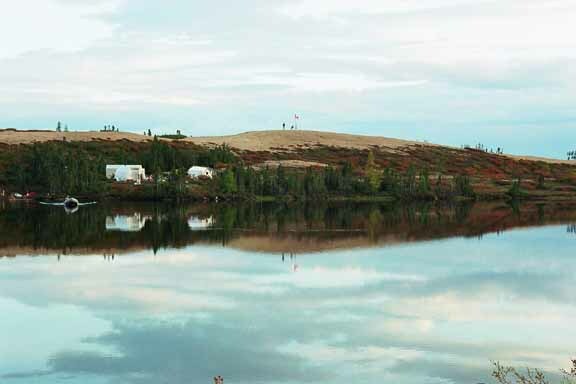 For the remaining time, we shot gongs at 100, 150, 200 and 225 yards from a variety of positions. We studied the trajectory of each gun with it's chosen bullet and powder. We shot and we shot until everyone was happy with their gun and their own skills. Our final scope setting put each rifle 3" high at 100 yards, dead on at 150 yards and 4.5" low at 200 yards. Very impressive for only 100 grains of powder. The results: We left with twelve caribou tags and we came back with one tag and eleven caribou. The closest shot was right at one hundred yards and the longest one was two hundred and two yards. We shot eight using 195 grain bullets and three using 175 grain bullets. Six with 100 grains of Triple 7 FFF and five with 100 grains of Triple 7 FF. We shot through ten out of eleven. The only non shoot through was an intentional quartering towards through the shoulder to test total penetration. The bullet was recovered in front of the opposite hip between the skin and the hide. We shot a total of twenty lungs. No animal required more than a single shot. There was a total of two misses. One at 100 yards at a B&C class bull that was harvested with a second shot at 123 yards several minutes later. A second bull was missed at 157 yards and was then harvested at 202 yards. Five animals were recovered without taking a single step. The longest recovery was about seventy five yards. Click on caribou photo gallery for complete photographs of our hunt. In closing: I am thrilled with the performance of our .357 Dead Center. They exceeded my expectations in accuracy, energy and performance on game. I consider them a labor of love as I spent a very large part of the last two years of my testing time developing first the sabot and then the bullet. If you were looking for a solid reason to add a .45 caliber muzzleloader to your collection, the .357 Dead Center bullet is it.